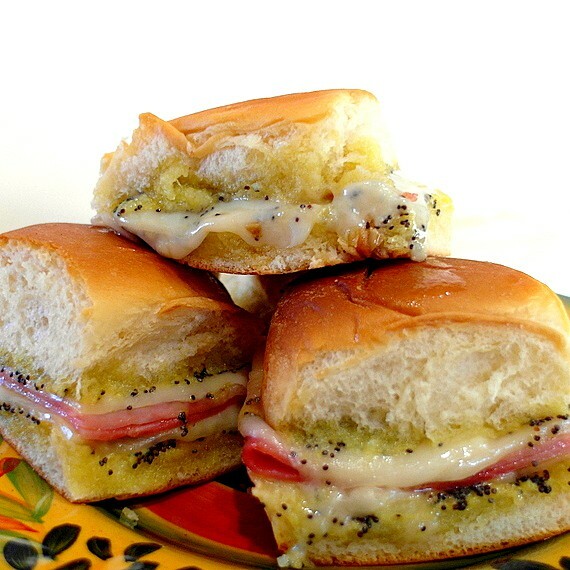 I am so happy you found me so I can show you how to make these ham and cheese sliders with poppy seeds. They are seriously the best! I am not even kidding about how great they are! 2 What Is the Best Cheese to Use for Party Ham Biscuits? 3 What makes these the best little ham and cheese sliders? 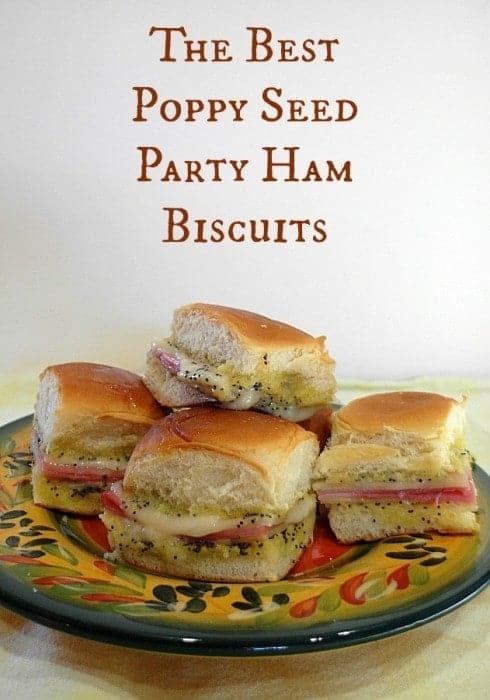 Apparently Pinterest is exploding with versions of poppy seed party ham biscuits. They go by many names including ham and cheese sliders, party ham biscuits, ham and Swiss rolls and who knows what else. 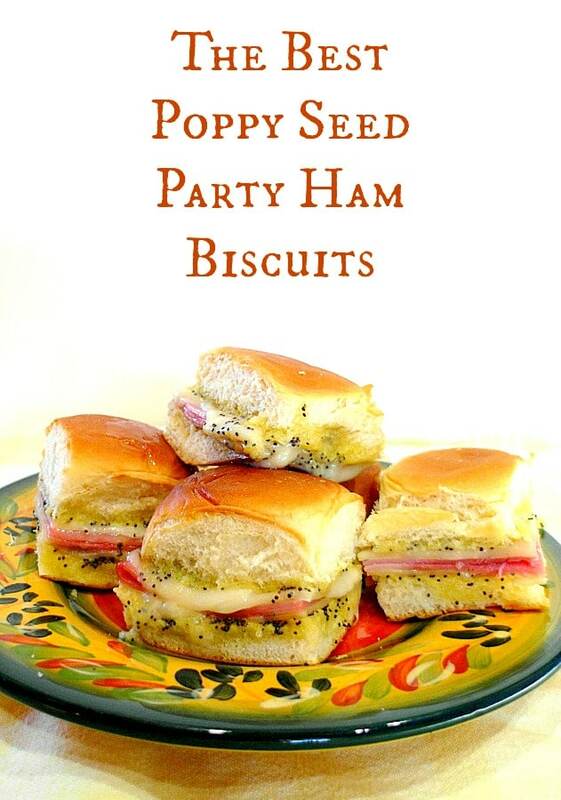 But I grew up knowing them as poppy seed party ham biscuits. So there you go. Anyway, hooray for their proliferation. And I say hooray, because while they might be new to many folks, I’ve been enjoying these little dudes for probably 45 years at our neighborhood Christmas Eve Party. You know, the same party where I also ate copious amounts of red sauce. Yes, this is another retro recipe, and since it is exploding in popularity on social media, I wondered if it was even worthwhile to post this version. I asked my readers, and many of them had still not heard of these guys, so I figure it’s my duty to share. 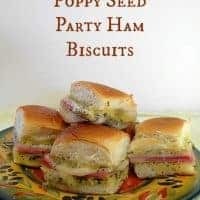 I’ve had other people’s ham biscuits, but honestly nothing I’ve had so far has compared to what I (and probably my entire old neighborhood) consider the best poppy seed party ham biscuits. I even made you guys a video to watch. Yay! What Is the Best Cheese to Use for Party Ham Biscuits? Swiss cheese. Hands down. As far as I’m concerned, accept no substitutes. If you really don’t like Swiss cheese, though, you could sub in a mild to medium cheddar or perhaps a Havarti cheese. We grew up referring to these little beauties as party ham biscuits. Whatever you call them, they are seriously delicious and seriously hard to stop eating! What makes these the best little ham and cheese sliders? I’m here to tell you that I’m not really sure. Here are some ideas. It might be the ratio of mustard to butter. It could be the amount of Worcestershire sauce. It may even be the finely chopped onion. It could also be the Very Very Lot of poppy seeds. Whatever it is, though, they really are the best. Please give them a try, and you’ll see. Oh, and guess what? This is also an 8 ingredient recipe (if you don’t include the salt, which you should not have to make a special trip to the store for)! Super easy to make. Super easy to eat. Honestly, I love this recipe just the way it is, poppy seeds and all. But if for some reason you don’t like poppy seeds or cannot have them, you can leave them out. The sliders will miss that slight crunch and subtle flavor of poppy seed, but you could potentially substitute in some sesame seeds or even some finely chopped nuts. If you’ve never had poppy seeds before and just think they sound weird in a sandwich, I ask you to please try the recipe as written at least once before opting to leave them out. Slice an entire tray of Hawaiian rolls horizontally. Layer on Swiss cheese, followed by ham and more cheese. Put the top of the package of rolls back on top. Place the whole shebang back in the original paper sleeve–yes, it can go in the oven! Cut between the individual rolls to separate them and bake at 350 for 10 minutes. If you need to leave them in longer for the cheese in the center to get melty, cover the rolls loosely with foil so the tops don’t get too brown. 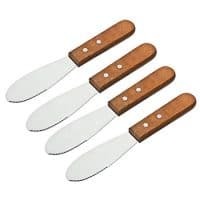 Generally these fly off the table so quickly that we’ve never had to worry about keeping them warm. But if you are serving a Suspiciou crowd, they may hang out on the buffet a bit longer. Here are a couple of ideas for keeping them warm for serving. 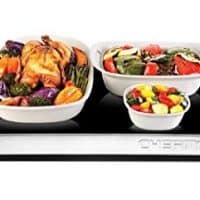 Both the bread warmer and the serving tray are versatile and would work for keeping rolls and foods of all sort warm for serving. Give them a look! The good news about heating your ham biscuits in the microwave is that it only takes a few seconds and the rolls stay nice and squishy. If you like your rolls squishy, stick with the microwave for reheating. If you prefer your sliders to have a bit of crunch to the rolls, then bake them in the oven. I would not try to heat the entire tray of biscuits in the microwave at one time, so reserve the microwave for reheating individual servings of a roll or two and bake whole trays in a conventional oven or a good toaster oven. You ready to make these guys? And seriously, you don’t have to share if you don’t want to! This recipe makes enough for a large flat of 24 King's Hawaiian Rolls. The original recipe makes enough for a flat of 12. I will admit this recipe is a little butter-heavy. You can cut back to 1 1/2 sticks if it makes you feel better. Don't change the amount of the other ingredients though. 1 flat of 24 King's Hawaiian Rolls or 2 flats of 12, (or similar small, soft rolls) They sell the 24-roll size at the warehouse club here. Mash together the first six ingredients very well. I start out with a potato masher and then use a spoon. You want a thick spread. Cut the flat of rolls in half horizontally, removing the top as one big slab. Spread each cut side of the flat with half the butter mixture. On the bottom flat, arrange one even layer of Swiss cheese, 2 even layers of ham and another even layer of Swiss. For me for the large size flat, I used 2 1/2 slices Swiss in each of three rows and the same for the ham. 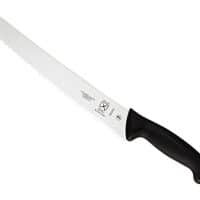 Carefully put the top of the flat back on the rolls and then use a bread knife to cut between each roll. Place the rolls back in their cardboard flat (it can go in the oven with no problem) or put them on a cookie sheet. At this point, you can refrigerate them for a week or freeze them, well wrapped, for several months. (Thaw before baking). Bake on the center of the oven at 350F for 10 minutes for small flats or 15 for large. You may have to cover the top with foil for the last 5 minutes or so. You can also heat them in the microwave until the cheese is lovely and melty. Microwaved party ham biscuits will be softer than the baked ones. I dare you to eat only one. Enjoy! Wait, before you run out and make these, make a short list of the only people you’re willing to share them with. My list is ever so short, and yours should be too. These are some of my all-time favorite appetizer recipes. I hope you’ll enjoy them too! Thanks so much for spending some time with me today. Take care, and have a lovely day. That’s me: super genius! lol I think it’s the *amount* of everything that’s the secret to these. I’ve seen some recipes that call for 1/4 teaspoon each of mustard and Worcestershire. Hmmph. Thanks, Audrey! I hope you give them a try! HOLY MOLY, Jenni. I LOVE these. The video is great and so helpful. I know this is one I will be making for my next party! All I can say, is if you haven’t made these yet then why the hell not?! They are awesome. Seriously awesome. Nothing more I can say about then expect make them. Really put the ingredients on your shopping list and go home and make them. Thanks Jenni. Jenni, I made these for my family over the Thanksgiving holiday and I wanted to let you know how delicious they were! A very big hit in my family and we’ll be making again this weekend with leftovers from the Christmas ham! Oh, this makes me so happy, Kelli! I’m thrilled you guys enjoyed them! I’m looking forward to some myself in just a couple of days. One of my favorite Christmas treats! Merry Christmas to you and your family! This is an old recipe that I used years ago and lost. Made the new version yesterday where the butter mix is on top and my husband said “No way.” Glad to find your recipe and I am making it for a Church luncheon tomorrow. Thanks for bringing back the old. Don’t mess with perfection, right?! Your church folks are lucky people, Ona. Enjoy!